7502. John Carlyle EVANS 1, 2, 3 (Freda Marie BUSH , Charles W BUSH , Margaret NEIL , Catherine BITLER , Daniel , John , Johannes ) was born on 23 Nov 1915 in OH. He died in Feb 1978. John resided in 1920 in Clay Twp, Auglaize Co, OH. He resided in 1930 in 127 Larkin St, Findlay, Hancock Co, OH. He was issued a social security number before 1951 in CA. John married Bernida KNOCH [scrapbook] 1, 2, 3, daughter of Dallas KNOCH and Thera CAMPBELL, on 13 Feb 1939. Bernida was born on 11 Jul 1922 in St Johns, Union Twp, Auglaize Co, OH. She died on 28 Apr 1974 in St Rita's Medical Center, Lima, Allen Co, OH. She was buried on 1 May 1974 in Greenlawn Cemetery, Wapakoneta, Auglaize Co, OH. Bernida was issued a social security number before 1951 in OH. She resided in Apr 1974 in Auglaize Co, OH. + 13052 M i Jack L EVANS was born on 17 Aug 1939. He died on 17 May 2010. Donald W EVANS 1 was born on 23 Dec 1940 in Wapakoneta, Auglaize Co, OH. He died on 8 May 2004 in St Rita's Medical Center, Lima, Allen Co, OH. Donald graduated from Blume High School in 1958. He resided in May 2004 in Rose St, Wapakoneta, Auglaize Co, OH. He worked as Truck Driver with Wall Bed Systems in Wapakoneta, OH. He served in the military with U.S. Navy. He was a member of Fraternal Order of the Eagles, Aerie 691. 13054 F iii Connie EVANS. + 13055 M iv James EVANS. + 13056 F v Patricia K "Patti" EVANS. Janet EVANS 1, 2 was born on 23 Mar 1949. She died on 23 Oct 1990 in Lima, Allen Co, OH. Janet married Norman SANDERS on 23 Nov 1964. Thomas EVANS 1 died before May 2010. Jerry EVANS died before May 2010. Jerry resided in Apr 1974 in Wapakoneta, Auglaize Co, OH. 13060 F ix Diane K EVANS. 13061 F x Sheri EVANS. 7513. Beatrice Euanna DAVIS [scrapbook] 1, 2, 3 (Orpha Ida DAVIS , Daniel Harvey DAVIS , Lovenia BITLER , Henry , Daniel , John , Johannes ) was born on 27 Feb 1905 in New Hampshire, Auglaize Co, OH. She died on 8 Jul 1986 in Lima, Allen Co, OH. She was buried in 1986 in Fairview Cemetery, Belle Center, Hardin Co, OH. Beatrice resided in Jul 1934 in Dayton, Montgomery Co, OH. She resided in Aug 1937 in Roscoe, IA. She resided in Nov 1963 in Mount Victory, Hardin Co, OH. She resided in Jun 1968 in Mount Victory, Hardin Co, OH. She resided in 1910 in Bloomfield Twp, Logan Co, OH. She resided in 1920 in Township Rd, Bloomfield Twp, Logan Co, OH. She worked as Student - Com School in 1920. She resided in 1935 in New Carlisle, Green Co, OH. She resided in 1940 in 335 Ft Amanda Rd, Shawnee, Allen Co, OH. She was issued a social security number before 1951 in OH. Beatrice married Herbert William EADS [scrapbook] 1, 2, 3, son of Charles EADS and Florence WILLIAMS, on 26 Dec 1923. Herbert was born on 4 Feb 1902 in Bellefontaine, Logan Co, OH. He died on 17 Sep 1965 in Hardin Memorial Hospital, Kenton, Hardin Co, OH. 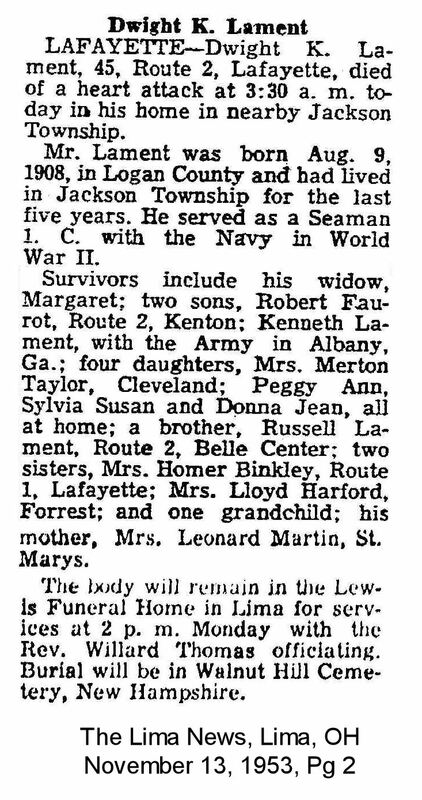 He was buried on 20 Sep 1965 in Fairview Cemetery, Belle Center, Hardin Co, OH. Herbert resided in Feb 1923 in Quincy, OH. He worked as catle herdsman in Feb 1923. He resided in Aug 1937 in Roscoe, IA. He was issued a social security number before 1951 in OH. He resided in Mount Victory, Hardin Co, OH. He resided in Kenton, Hardin Co, OH. He resided in Cridersville, Auglaize County, OH. He worked in Sep 1965 in Kenton, Hardin Co, OH. He resided in Sep 1965 in Belle Center, Hardin Co, OH. The cause of his death was heart failure. He resided in 1935 in New Carlisle, Green Co, OH. He resided in 1940 in 335 Ft Amanda Rd, Shawnee, Allen Co, OH. He worked as material handler in 1940. + 13062 F i Marcella Irene EADS was born on 5 Oct 1928. She died on 11 Aug 1984. + 13063 F ii Virginia Rose EADS. 13064 F iii Elizabeth Ann EADS. 13065 M iv Herbert Leland EADS. Beatrice also married Charles E NEWMAN Sr.
7514. Dwight Kenneth LAMENT [scrapbook] 1, 2, 3, 4, 5 (Orpha Ida DAVIS , Daniel Harvey DAVIS , Lovenia BITLER , Henry , Daniel , John , Johannes ) was born on 9 Aug 1908 in Logan Co, OH. He died on 13 Nov 1953 in Jackson Twp, Allen Co, OH. He was buried on 16 Nov 1953 in Walnut Hill Cemetery, New Hampshire, Goshen Twp, Auglaize Co, OH. Dwight resided in Mar 1946 in Belle Center, OH. He served in the military with U.S. Navy - Seaman 1st Class in WW II. He resided from 1948 to 1953 in Jackson Twp, Allen Co, OH. He worked as Farmer. He was issued a social security number . Dwight married Lula Mae SPENCER on 15 Sep 1931. + 13066 F i Dolores June "June" LAMENT. + 13067 M ii Robert Earl LAMENT FAUROT was born on 15 Nov 1933. He died on 5 Jul 1981. + 13068 M iii Kenneth Leroy LAMENT was born on 17 Dec 1934. He died on 18 Oct 2007. Chester LAMENT 1 died before 2007. Dwight also married 1 Margaret Althea MYERS [scrapbook] 2, 3, daughter of Walter Leonard MYERS and Lulu M WHEELER, on 14 Apr 1946 in Belle Center, Logan Co, OH. Margaret was born on 14 Apr 1921. She died on 13 Aug 2011 in Kenton, Hardin Co, OH. She was buried in Walnut Hill Cemetery, New Hampshire, Auglaize Co, OH. Margaret resided in Jul 1950 in Lafayette, OH. 13070 F v Donna Jean LAMENT. 13071 F vi Peggy Ann LAMENT. Peggy married Brian Eugene ALEXANDER. 13072 F vii Sylvia Susan LAMENT. Sylvia married Rodney G MCQUOWN. 7515. Glenna Mae LAMENT 1, 2, 3, 4, 5 (Orpha Ida DAVIS , Daniel Harvey DAVIS , Lovenia BITLER , Henry , Daniel , John , Johannes ) was born on 9 Dec 1911 in Troy, Miami Co, OH. She died on 7 Nov 1998 in Lima Memorial Hospital, Lima, Allen Co, OH. She was buried in Salem Cemetery, Auglaize Twp, Allen Co, OH. Glenna resided in 1930 in Round Head Twp, Hardin Co, OH. She resided in Mar 1946 in Lafayette, OH. She resided in Nov 1953 in Route 1 Lafayette, Allen Co, OH. She was issued a social security number in 1963. She resided in Jun 1968 in Lafayette, Allen Co, OH. Glenna married Earl W BURNISON on 24 Feb 1930. Earl was born about 1884 in OH. Earl resided in 1930 in Round Head Twp, Hardin Co, OH. He worked as Mail Carrier - Government (Rural Route) in 1930. 13073 M i Carol Gene BURNISON. Carol married Patricia Lou MCCUNE. 13074 M ii Lee BURNISON. + 13075 F iii Colene Toinette BURNISON. Glenna also married Homer J BINKLEY 1, 2, 3, 4, 5 on 20 Nov 1940. Homer was born on 14 Jul 1902 in Hardin Co, OH. 13076 M iv [Male] BINKLEY. 7516. Beryl Verdel LAMENT 1, 2, 3, 4, 5, 6, 7, 8 (Orpha Ida DAVIS , Daniel Harvey DAVIS , Lovenia BITLER , Henry , Daniel , John , Johannes ) was born on 23 Feb 1913 in OH. She died on 24 Jan 1991 in Forest, Hardin Co, OH. Beryl resided in 1940 in Township Line Rd, Salem, Wyandot Co, OH. She resided in Mar 1946 in Forest, Hardin Co, OH. She resided in Nov 1953 in Forest, Hardin Co, OH. She resided in Jun 1968 in Forest, Hardin Co, OH. Beryl married 1 Lloyd Marshall HARFORD 1, 2, 3, 4, 5, 6, 7, son of John Roderick HARFORD and Mary BRYAN. Lloyd was born on 1 Sep 1907 in OH. He died on 17 Aug 1985 in Hardin Memorial Hospital, Kenton, Hardin Co, OH. Lloyd resided in 1910 in Clay Twp, Auglaize Co, OH. He resided in 1940 in Township Line Rd, Salem, Wyandot Co, OH. He worked as proprietor with Corner Market in Forest, Hardin Co, OH. + 13077 M i Conwell Byron "Connie" HARFORD was born on 24 Mar 1931. He died on 11 Nov 2004. + 13078 F ii Marilyn Maxine HARFORD. + 13079 M iii John E HARFORD was born on 26 Jun 1934. He died on 3 Dec 1998. Marjery A HARFORD 1, 2 was born on 13 Jan 1936 in Belle Center, Hardin Co, OH. She died on 21 Oct 2004 in Hardin Memorial Hospital, Kenton, Hardin Co, OH. She was buried on 25 Oct 2004 in Hueston Cemetery, Forest, Hardin Co, OH. Marjery resided in 1940 in Township Line Rd, Salem, Wyandot Co, OH. She was issued a social security number in 1955 in OH. She resided in Forest, Hardin Co, OH. She resided in 2004 in Kenton, Hardin Co, OH. She worked with Harco Industries in Kenton, Hardin Co, OH. 7518. Russell R LAMENT 1, 2, 3, 4, 5, 6, 7, 8 (Orpha Ida DAVIS , Daniel Harvey DAVIS , Lovenia BITLER , Henry , Daniel , John , Johannes ) was born on 19 Aug 1916 in OH. He died on 24 Oct 1980 in Belle Center, Hardin Co, OH. He was buried in Walnut Hill Cemetery, New Hampshire, Auglaize Co, OH. Russell resided in 1947 in Belle Center, Logan Co, OH. He resided in Nov 1953 in Route 2 Belle Center, Hardin Co, OH. He resided in Jun 1968 in Belle Center, Logan Co, OH. He was issued a social security number in 1955/1957 in OH. He resided in Oct 1980 in Hardin Co, OH. Russell married Agnes Wanda KUAILE [scrapbook] 1, 2, 3, daughter of Edward P KUAILE and Mary LEASURE, about Jul 1936 in Hardin Co, OH. Agnes was born on 20 Oct 1915 in Hardin Co, OH. She died on 9 Sep 1974 in Lima Memorial Hospital, Lima, Allen Co, OH. She was buried on 12 Sep 1974 in Walnut Hill Cemetery, New Hampshire, Goshen Twp, Auglaize Co, OH. Agnes worked as Housewife. She was a member of United Methodist Church in Roundhead, Hardin Co, OH. 13081 F i [Female] LAMENT. Maxine Virginia LAMENT 1, 2, 3 was born on 16 Feb 1937 in Roundhead, Hardin Co, OH. She died on 13 Feb 2001 in Lima Memorial Hospital, Lima, Allen Co, OH. She was buried in Walnut Hill Cemetery, New Hampshire, Auglaize Co, OH. Maxine was issued a social security number in OH. She resided in Sep 1974 in 775 1/2 Richie Ave, Lima, Allen Co, OH. She resided in Jan 1995 in Waynesfield, Auglaize Co, OH. She worked with United Telephone. Maxine married Frank Webb HAYER on 12 Oct 1974. 13083 M iii Larry L LAMENT. + 13084 M iv Herbert Dean "Buzzie" LAMENT was born on 19 Jun 1943. He died on 8 Jan 1995. 13085 M v Byron L LAMENT. 13086 F vi Judy Ann LAMENT. Judy also married [Male] STEED. 13087 F vii Diane Kay LAMENT. 13088 F viii Janice L LAMENT. Janice also married Alvin D PAULEY. 13089 F ix Betty J LAMENT. 7520. Carl Gorden DAVIS [scrapbook] 1, 2, 3 (Robert Roscoe DAVIS , Daniel Harvey DAVIS , Lovenia BITLER , Henry , Daniel , John , Johannes ) was born on 3 Jun 1912 in Clay Twp, Auglaize Co, OH. He died on 26 Jan 1963 in Wapakoneta, Auglaize Co, OH. He was buried on 30 Jan 1963 in Walnut Hill Cemetery, New Hampshire, Auglaize Co, OH. Carl resided in 1920 in Huntsville And Lewistown Pike, McArthur Twp, Logan Co, OH. He resided in 1940 in Stokes Twp, Logan Co, OH. He resided in 1942 in W Market St, Lima, Allen Co, OH. He resided in May 1955 in Wapakoneta, Auglaize Co, OH. He worked as highway department foreman in OH. The cause of his death was heart attack. Carl married Elsie M SCHULTZ [scrapbook] 1, 2, daughter of Herman Augusta SCHULTZ and Elizabeth Ellen THOMPSON, on 2 Sep 1938. Elsie was born on 7 Jun 1918 in Near Santa Fe, Clay Twp, Auglaize Co, OH. 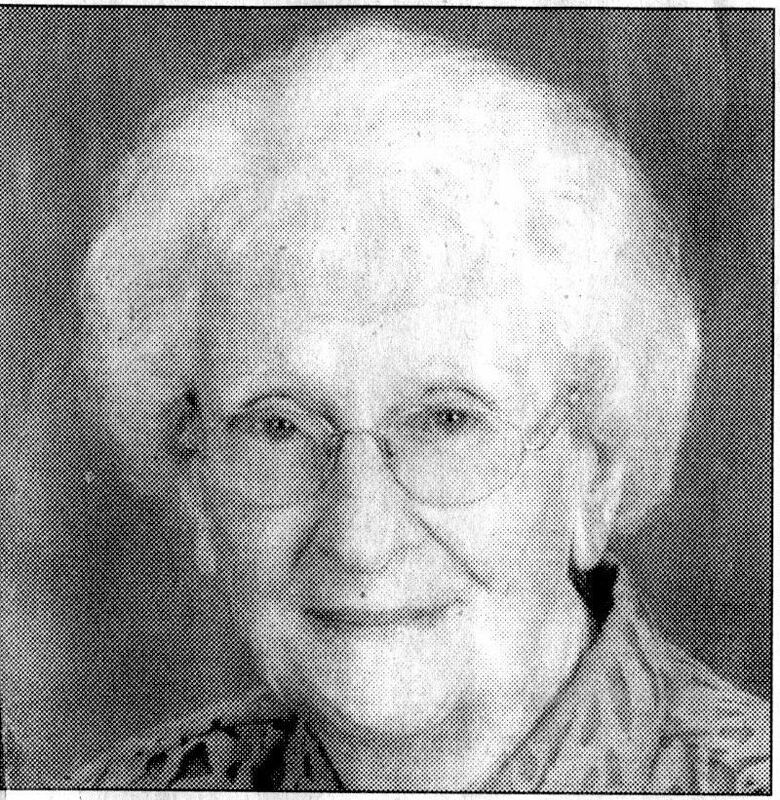 She died on 25 Nov 2010 in Wapakoneta Manor Nursing Home, Wapakoneta, Auglaize Co, OH. She was buried on 30 Nov 2010 in Walnut Hill Cemetery, New Hampshire, Auglaize Co, OH. Elsie resided in 1940 in Stokes Twp, Logan Co, OH. She resided in Spencerville, Allen Co, OH. She resided in Wapakoneta, Auglaize Co, OH. + 13090 M i Stephen L "Steve" DAVIS. 7521. Bernice M DAVIS (Robert Roscoe DAVIS , Daniel Harvey DAVIS , Lovenia BITLER , Henry , Daniel , John , Johannes ). Bernice married Bernard A IDLE "Bernie", son of Vance Bernard IDLE and Beryl M SMITH. Bernie was born on 20 Mar 1916 in Clay Twp, Auglaize Co, OH. He died on 31 Jan 2012 in Northridge, Montgomery Co, OH. He was buried in Dayton Memorial Park Cemetery, Dayton, Montgomery Co, OH. Bernie resides in 1920 in Clay Twp, Auglaize Co, OH. He resides in 1930 in Clay Twp, Auglaize Co, OH. He resides in 1940 in Bellefontaine, Logan Co, OH. He resides in 1944 in 917 Webster St, Dayton, OH. He worked as Mechanic in 1944. He resides in 1979 in 2112 Gipsy Dr, Dayton, OH. He worked as over the road truck driver (40 yrs) with Commercial Motor Freight and Motor/Central Transportation. He was a member of Teamsters Local #957. + 13091 M i William Bernard IDLE Sr.
+ 13092 M ii Kenneth Richard IDLE Sr.
7523. Lyman W DAVIS 1, 2 (Orral Morris DAVIS , Daniel Harvey DAVIS , Lovenia BITLER , Henry , Daniel , John , Johannes ) was born on 23 Jun 1912 in Logan Co, OH. He died on 11 Oct 1996 in Cridersville, Auglaize Co, OH. Lyman resided in 1920 in Santa Fe Rd South, Stokes Twp, Logan Co, OH. He resided in 1930 in Stokes Twp, Logan Co, OH. He resided in 1940 in County Rd 54, Stokes Twp, Logan Co, OH. He worked as farmer - farming in 1940. He resided in 1966 in Lewistown, OH. He resided in Dec 1971 in Lewistown, OH. Lyman married Defaris Louise AMBOS [scrapbook] 1, daughter of Philip AMBOS and Mary SHIFLET, on 30 Aug 1933. Defaris was born on 29 Sep 1916 in Jackson Center, Shelby Co, OH. She died on 10 Nov 1966 in Mary Rutan Hospital, Bellefontaine, Logan Co, OH. She was buried on 13 Nov 1966 in Clem Cemetery, Port Jefferson, Shelby Co, OH. Defaris resided in 1940 in County Rd 54, Stokes Twp, Logan Co, OH. She resided in Nov 1966 in Rt 1 Lewistown, OH. 13093 M i Lanny DAVIS. Lanny married Betty Jane CONNOLE. 13094 F ii Kay DAVIS. 13095 F iii Sondra S DAVIS. 7524. Roy Monroe DAVIS 1, 2 (Orral Morris DAVIS , Daniel Harvey DAVIS , Lovenia BITLER , Henry , Daniel , John , Johannes ) was born on 10 Jan 1914 in Logan Co, OH. He died on 2 Jan 1998 in Mary Rutan Hospital, Bellefontaine, Logan Co, OH. He was buried in Greenwood Cemetery, DeGraff, Logan Co, OH. Roy resided in 1920 in Santa Fe Rd South, Stokes Twp, Logan Co, OH. He resided in 1930 in Stokes Twp, Logan Co, OH. He was issued a social security number in 1955/1956 in OH. He resided in Dec 1971 in Lewistown, OH. Roy married Josephine Alice MATTOX "Jo" [scrapbook] 1, daughter of Edward MATTOX and Ruth HOLMES, on 17 Aug 1934. Jo was born on 14 Feb 1917 in Logan Co, OH. She died on 10 Sep 2009 in Mary Rutan Hospital, Bellefontaine, Logan Co, OH. She was buried in Greenwood Cemetery, DeGraff, Logan Co, OH. Jo was a member of First Church of God in Bellefontaine, Logan Co, OH. She worked as homemaker. 13096 F i Nancy E DAVIS. Nancy married Michael R HERREN. Robert Morris DAVIS 1 was born on 21 Feb 1941. He died on 23 Jun 1941. He was buried in Greenwood Cemetery, DeGraff, Logan Co, OH. 13098 M iii William DAVIS. 13099 M iv Thomas "Tom" DAVIS. + 13100 F v Jennifer L DAVIS. 13101 F vi Cinda Kay DAVIS. Cinda married Sherman R SHELDON "Rod". + 13102 F vii Mary Lou DAVIS. 7525. Cecil W DAVIS 1 (Orral Morris DAVIS , Daniel Harvey DAVIS , Lovenia BITLER , Henry , Daniel , John , Johannes ) was born on 29 May 1915 in Logan Co, OH. He died on 27 Dec 1971 in Memorial Hospital, Lima, Allen Co, OH. Cecil resided in 1920 in Santa Fe Rd South, Stokes Twp, Logan Co, OH. He resided in 1930 in Stokes Twp, Logan Co, OH. He resided in 1940 in Stringtown Pike, Stokes Twp, Logan Co, OH. The cause of his death was heart attack. Cecil married Arlena R METZ 1, 2, daughter of Philip J METZ and Catherine BARNHART, on 23 Apr 1938. Arlena was born on 20 Feb 1916 in Stokes Twp, Logan Co, OH. She died on 17 May 2003 in Grant Hospital, Columbus, Franklin Co, OH. She was buried in Greenlawn Cemetery, Wapakoneta, Auglaize Co, OH. Arlena resided in 1940 in Stringtown Pike, Stokes Twp, Logan Co, OH. She resided in Jul 1947 in Lakeview Rt 1, Logan Co, OH. She resided in Lakeview, Logan Co, OH. She resided in 2003 in Dublin, Franklin Co, OH. She was a member of Emanuel Lutheran Church in Montra, OH. + 13103 M i Murray DAVIS. + 13104 F ii Judith DAVIS. 7531. June VORHEES (Beryl E DAVIS , Daniel Harvey DAVIS , Lovenia BITLER , Henry , Daniel , John , Johannes ). 13105 M i [Male] ARNOLD. 13106 F ii [Female] ARNOLD.